Jake and I are now annual passholders at Disneyland! 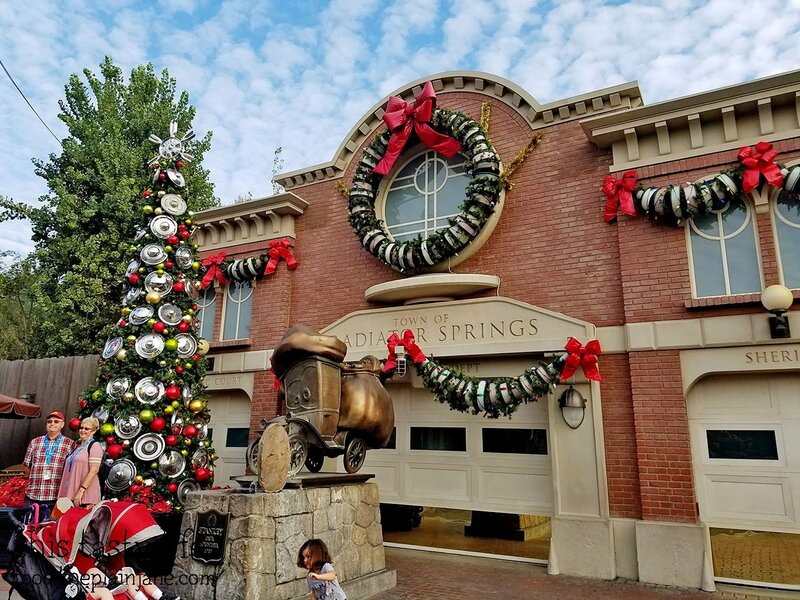 We visited last week to check out the holiday decorations and food. Check out what we tried! Parking has gone up by $2 since our visit last October. Ugh. We managed to get onto Main Street before the park opened. 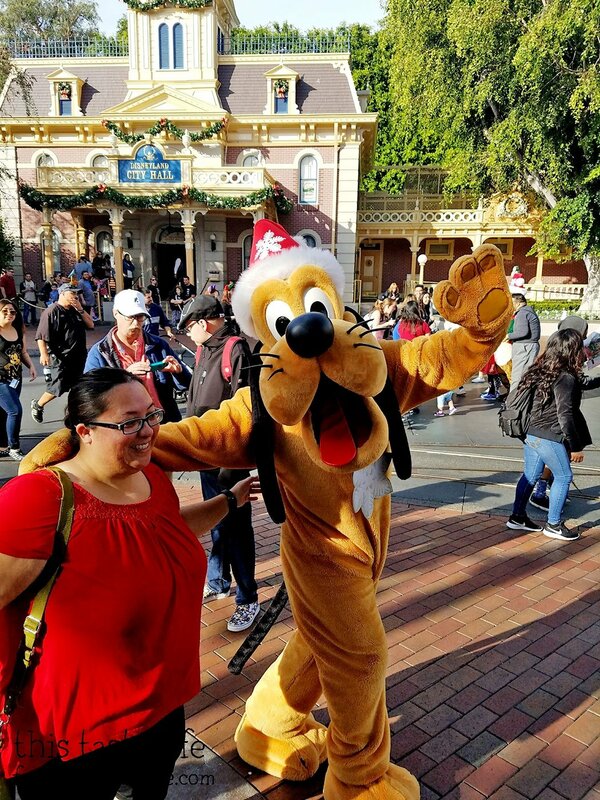 Pluto was wandering around and didn’t want to stay still for a photo, so this was the best we got. A Pluto-by, if you will. The first ride we hopped on was Star Tours since it was only a 5 minute wait. SCORE. After that we picked up a Fastpass for Space Mountain. Then we went on Buzz Lightyear’s Astro Blasters (Jake won, I sucked), got a snack, and then went on Finding Nemo’s Submarine Voyage before picking up a Fastpass for the Matterhorn and then swinging back to get on Space Mountain. Phew! 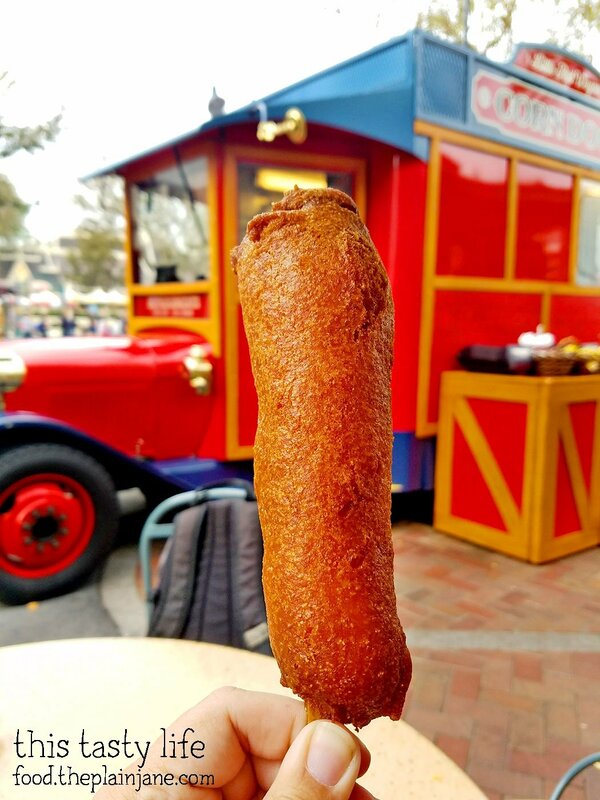 We love the corn dogs from the Little Red Wagon on Main Street. Pro tip: you can ask for the corn dog by itself without the sides which drops the price to $7.25, saving you $2.25. I had to keep remembering to show my Annual Pass for a discount since I couldn’t seem to remember I was now a passholder! I should have just shared a corn dog with Jake since I couldn’t finish one on my own, but damn, it was so good. The batter tastes like cornbread and has a slight sweet flavor to it. The hot dog is thick and meaty – quite filling! After getting jostled around on the Matterhorn (which Jake and I have decided we will not ride again, because damn, every turn was slamming us into the sides of the ride and it hurt! 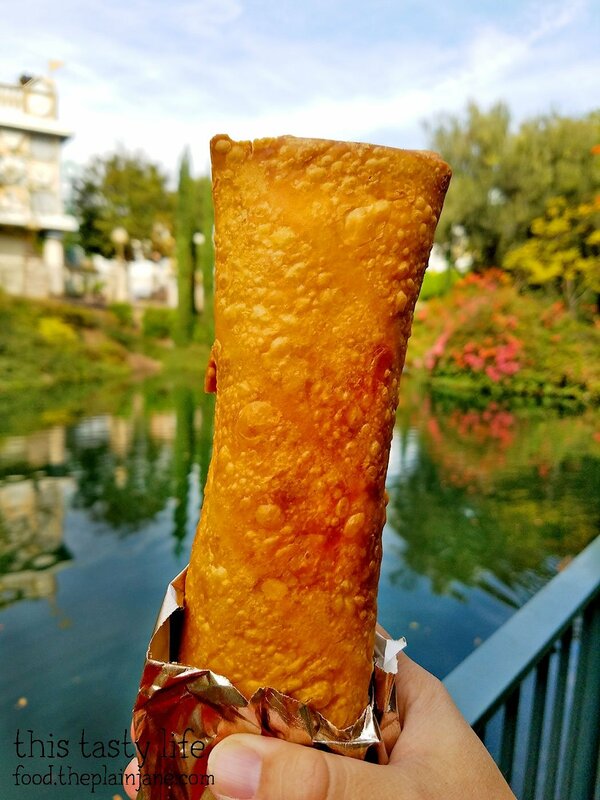 ), we stopped for snack #2 which was a Chimichanga [$6.29] from Edelweiss Snacks in Fantasyland. No AP discounts here. The chimichanga is like one of those cheapies bean and cheese burritos, but fried. The top and bottom were seriously overcooked and hard to bite into. It was hot, warm, and tasted fine. Not amazing. But it’s HUGE and it can tide you over until you get another snack. I’d skip this in the future. 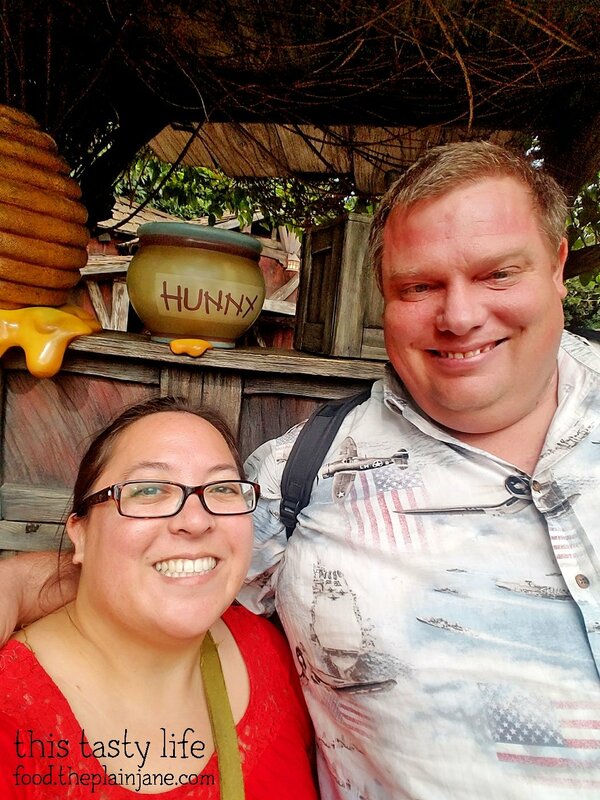 For our first “real” meal at Disneyland that day, we headed over to the Red Rose Taverne in Fantasyland. 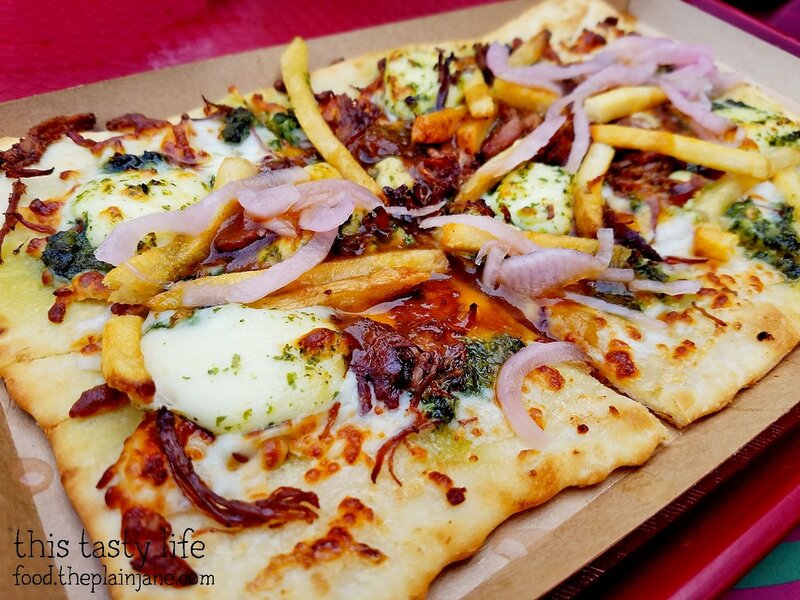 I had read about this Poutine Flatbread [$9.49] and was excited to try it. It’s got french fries on top (! ), cheese curds, pickled onions (ew), roasted garlic aioli, herb oil, and gravy on top. The flatbread is cut into six pieces. It’s a hefty meal! I liked the cheese and gravy on top. The french fries made it interesting but didn’t really add to the flavor. I could do without them but then I guess it wouldn’t be “poutine flatbread”, eh. I wish there had been a little bit more cheese (like a layer of cheese) and the gravy spread more evenly across. Overall flavor was good though and the flatbread itself had a crisp bottom that I enjoyed. I was super excited to finally try Grey Stuff [$5.49]! 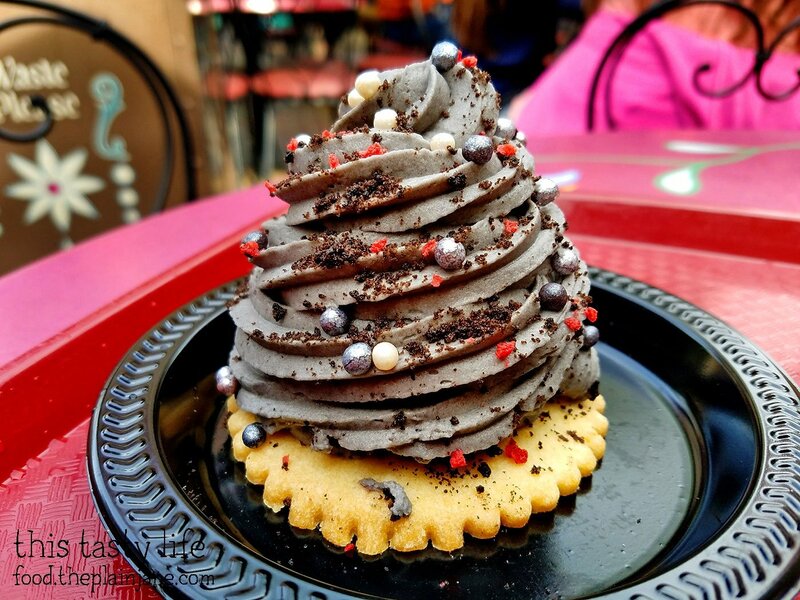 Grey stuff is quite dramatic looking with this big swirl of, well, “grey stuff” on top of a cookie. 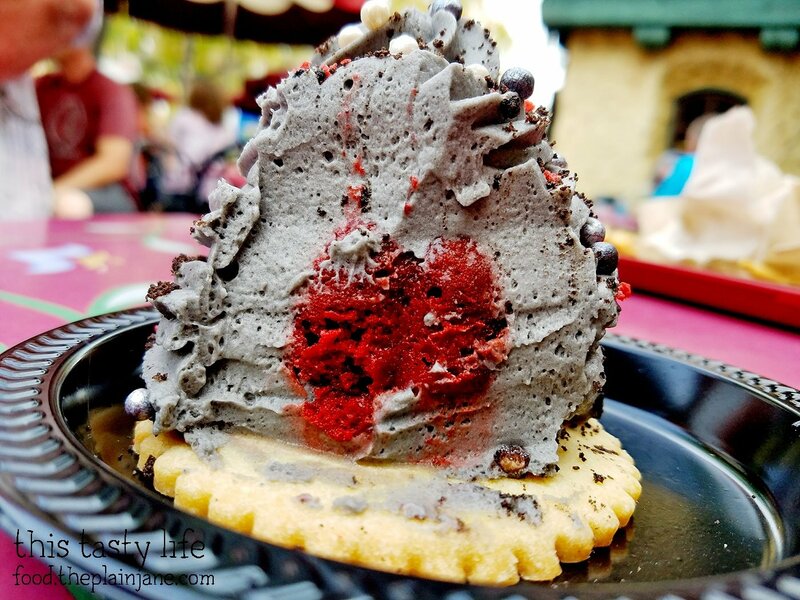 The “grey stuff” is actually a white chocolate mousse with a light whipped cream-like texture to it. There are crumbs on top plus little crunchy pearls. Sitting in the middle of the grey stuff is a red velvet cake with raspberry on top. Yummy!! The cookie base was really soft – I was expecting it to hard/crunchy! That was the only disappointing part because otherwise this grey stuff was DELICIOUS. We did some wandering after lunch. Picked up a Fastpass for Big Thunder Railroad and then mosied on over to Pooh’s Corner. We hopped on the Winnie the Pooh ride before peaking into the sweets shop. 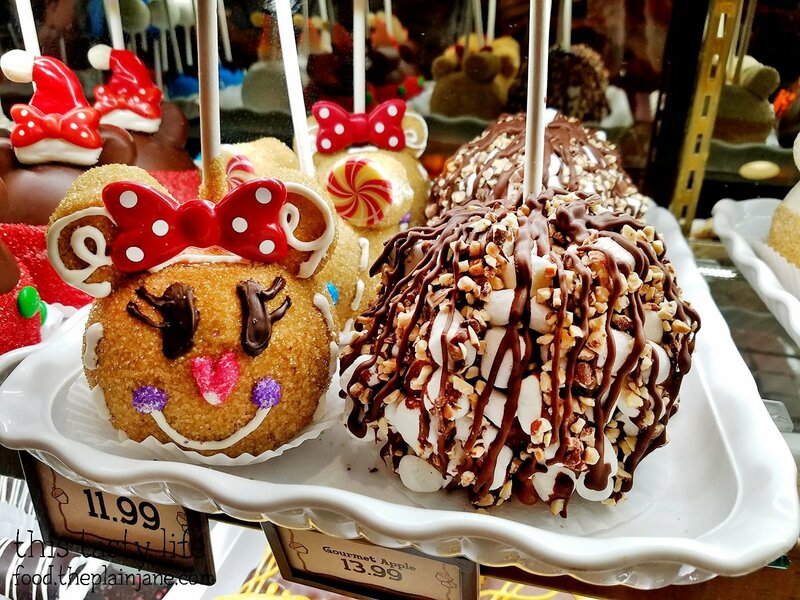 Check out this darling decorated apples! Gosh, they were so cute. The cake pops were equally as cute. I was full when we stopped by Pooh’s Corner which is probably good since I was too full to munch on anything even though it all looked so good. After going on Big Thunder Railroad, we planned to hop over to California Adventure. 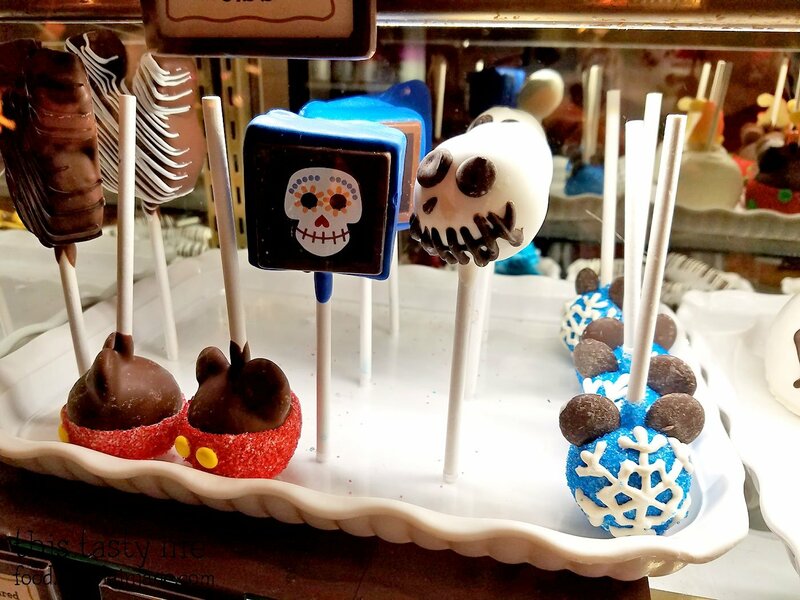 But first, a stop at Jolly Holiday Bakery. 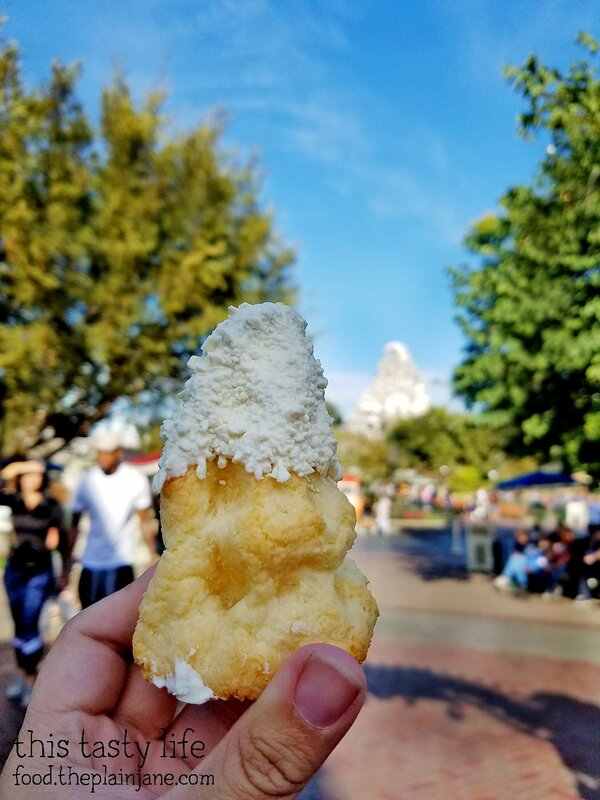 I got a Matterhorn Macaroon [$2.99] which I ate the next day at work. The top is white chocolate and totally looks like Matterhorn mountain in the distance! I always get one of these to eat later. 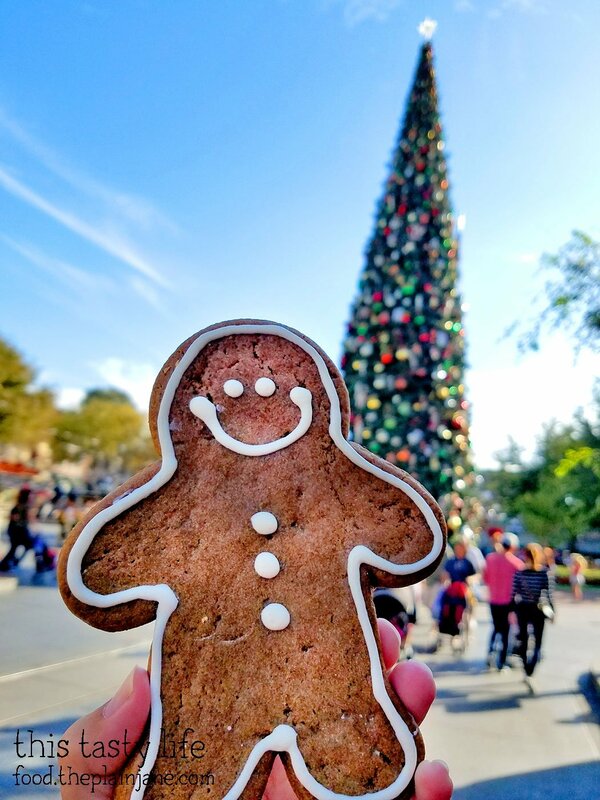 Also got a Gingerbread Cookie [$3.99] which we ate later while standing in line for the Ferris Wheel. The gingerbread cookie has a distinct molasses flavor and is nice and soft. It was SO GOOD. Jake and I gobbled it up and loved the flavor of this cookie. Definitely need to get another one before the season is over. 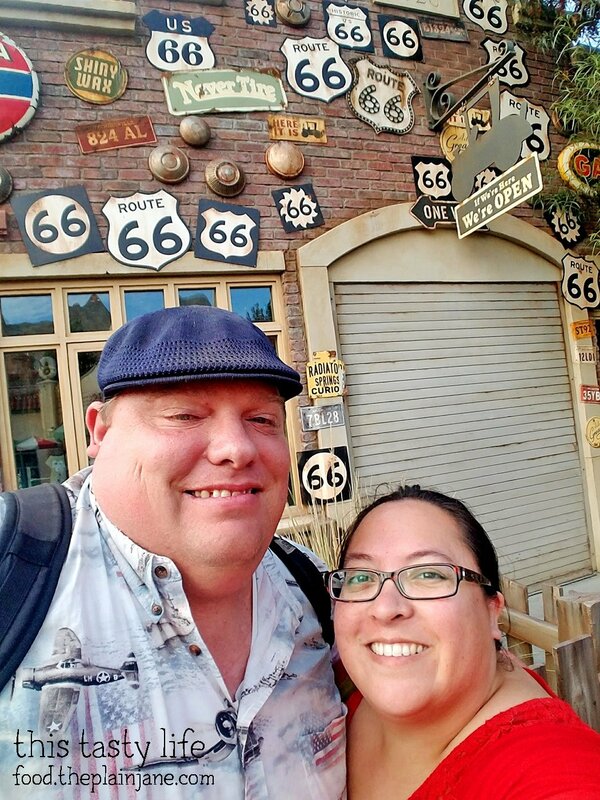 We checked out a few rides in Cars Land. 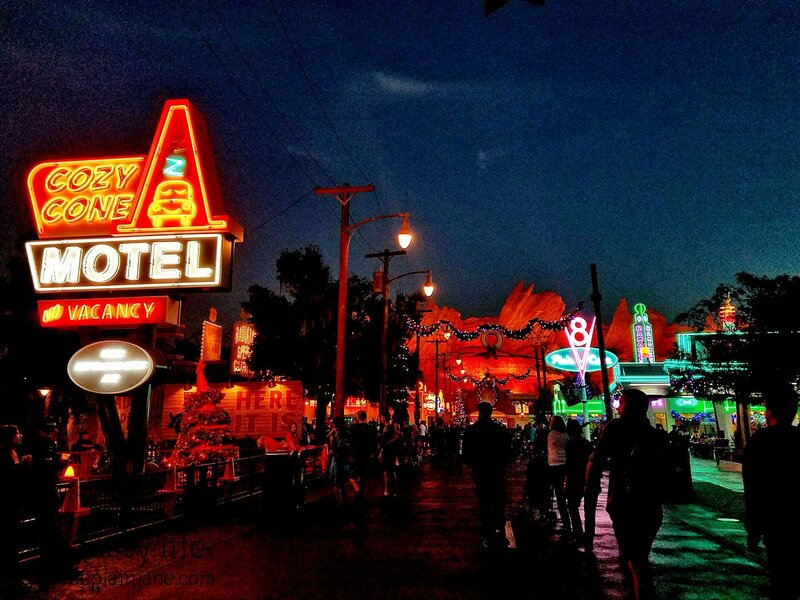 Jake and I haven’t been to California Adventure in AGES so we were delighted at how cute Cars Land is! 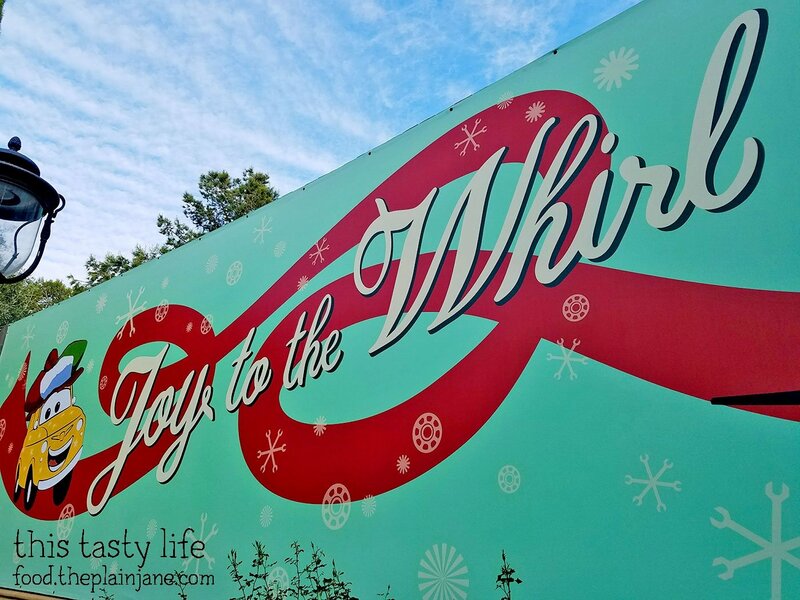 Riding on Luigi’s “Joy to the Whirl”. The attention to detail in Cars Land is amazing. The hubcaps on the Christmas tree amused me. 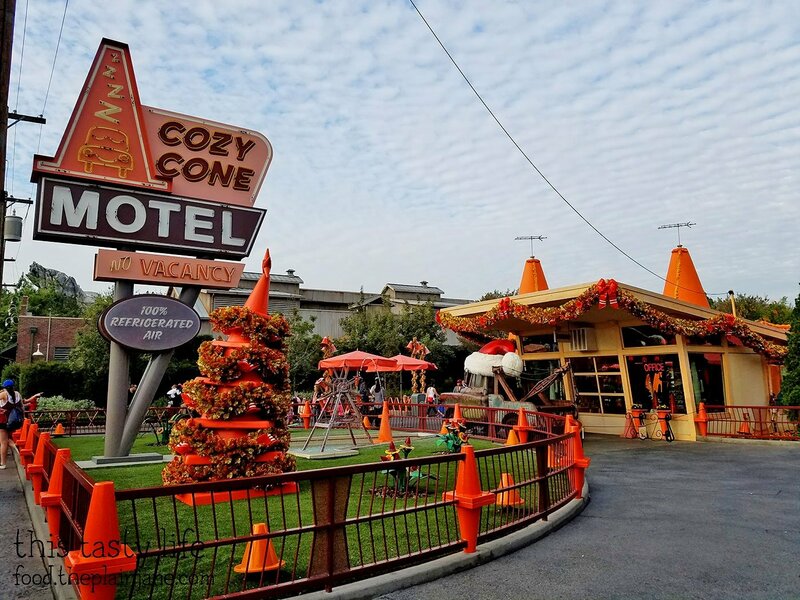 The Cozy Cone motel! You can’t actually go into the lobby here, but you can peek inside. Behind the lobby are the cones. Each cone sells something different. 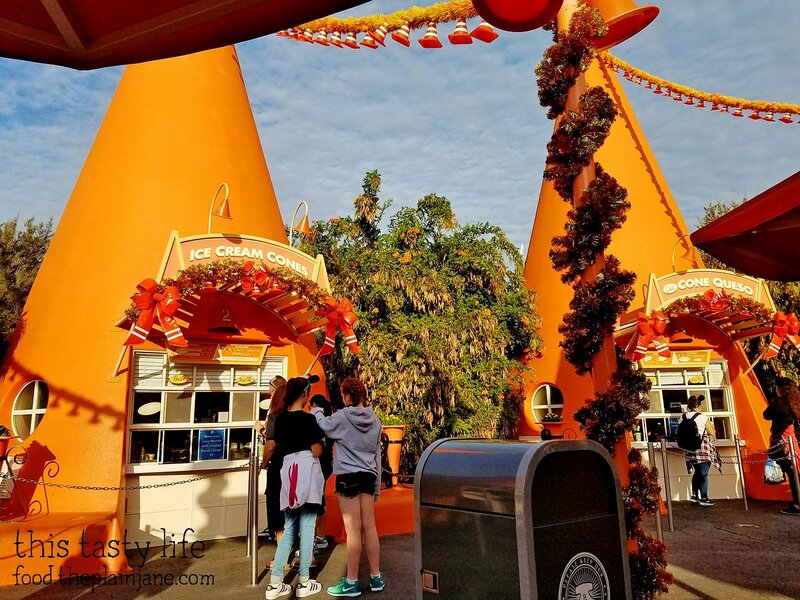 Churros, drinks, ice cream cones, “cone” queso, and popcorn. I got the Chili “Cone” Queso [$8.99]. 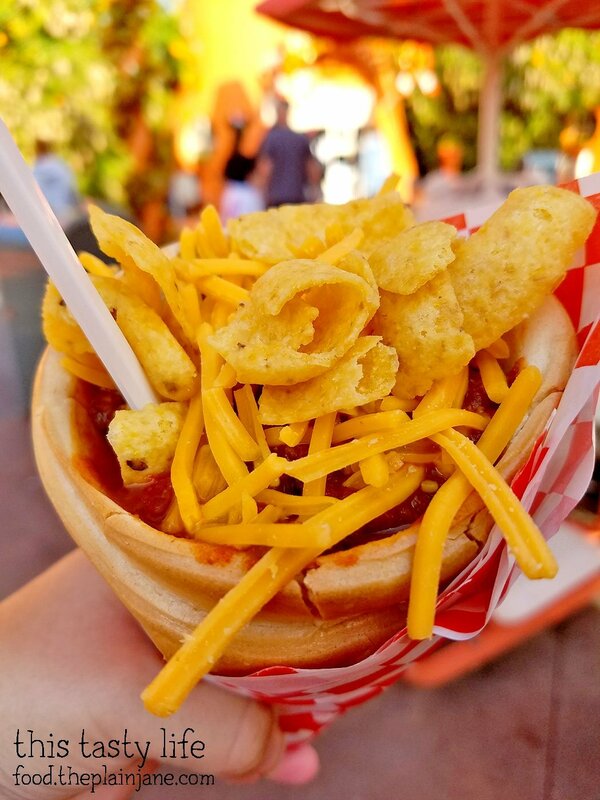 It’s a bread cone filled with beef chili, cheese, and fritos! The fritos are all the way through the cone, not just on the top either! The chili was nice and savory and I quite enjoyed the flavor of it. Not too spicy and good texture. I didn’t like eating the bread cone though. It was hard and flavorless and really just serves as a vessel to hold your chili. 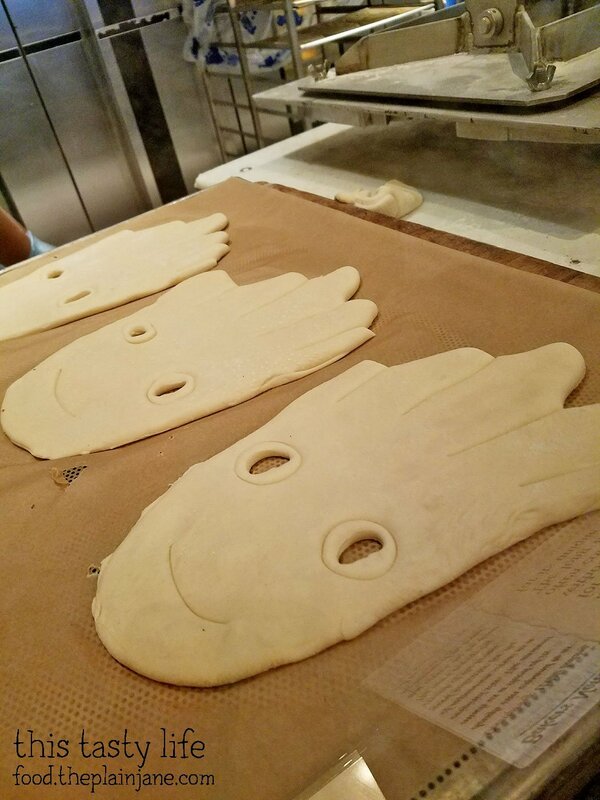 I kind of regret not getting a Groot sourdough bread. Next time! We didn’t eat much else at the park that day. 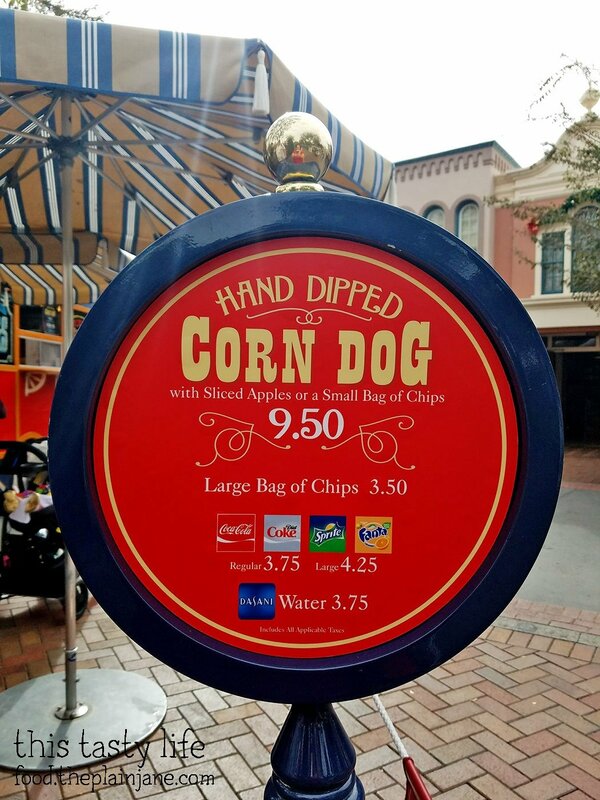 The only other thing I got was popcorn in a holiday bucket near the entrance to California Adventure. I think the popcorn tastes better over in Disneyland! This one was a bit too salty and didn’t taste quite as fresh. It was fun walking through to see the park lit up. 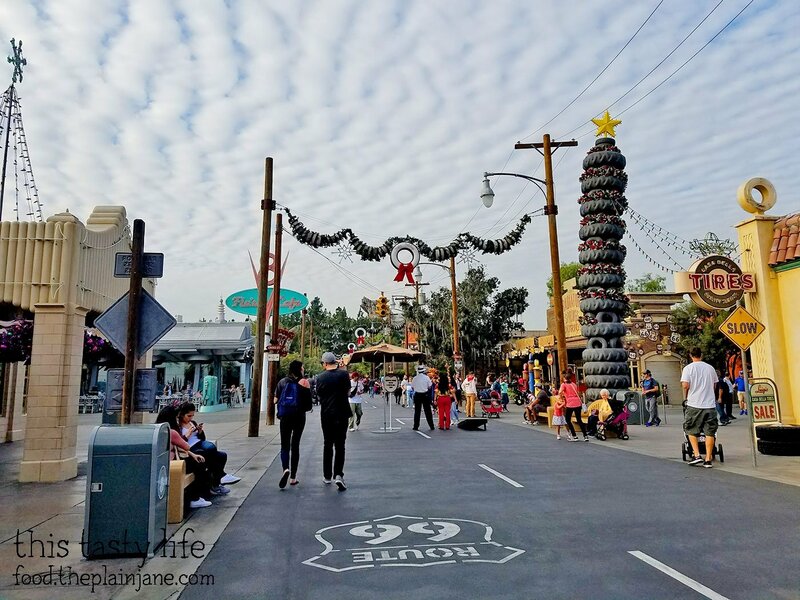 We also hit Mater’s Junkyard Jamboree (which was playing Christmas music sung by Mater), the non-swinging Ferris Wheel (screw those swinging cabs, OMG), the Guardians of the Galaxy ride (SO MUCH FUN), as well as the Monster’s Inc ride. 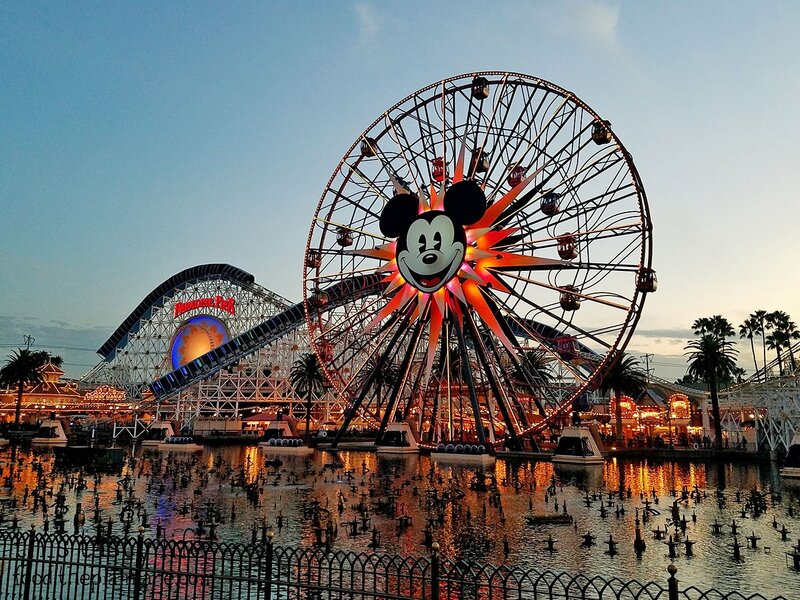 Our next trip we plan to spend some more time exploring the rides at California Adventure! 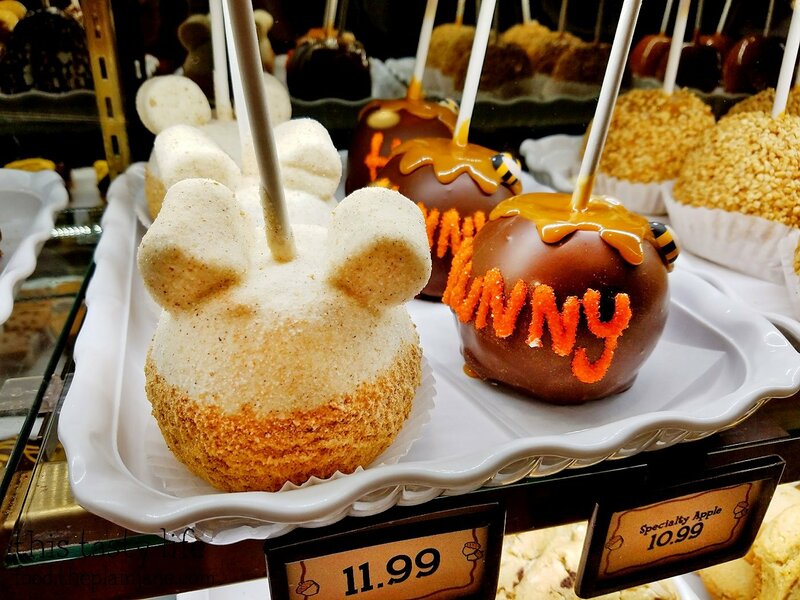 What’s your favorite ride at either park and your favorite thing to snack on? 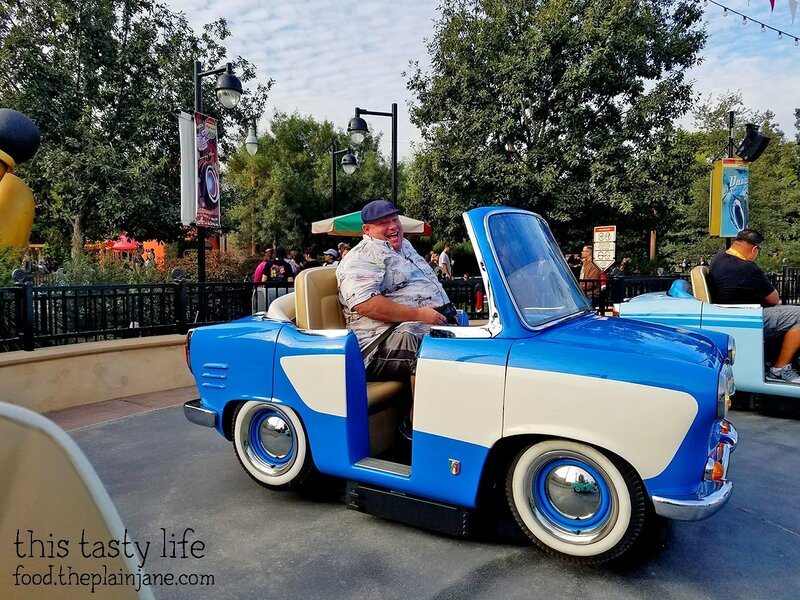 What should I try on my next visit to Disneyland? Let me know in the comments below! Hi Nicole – Thank you! 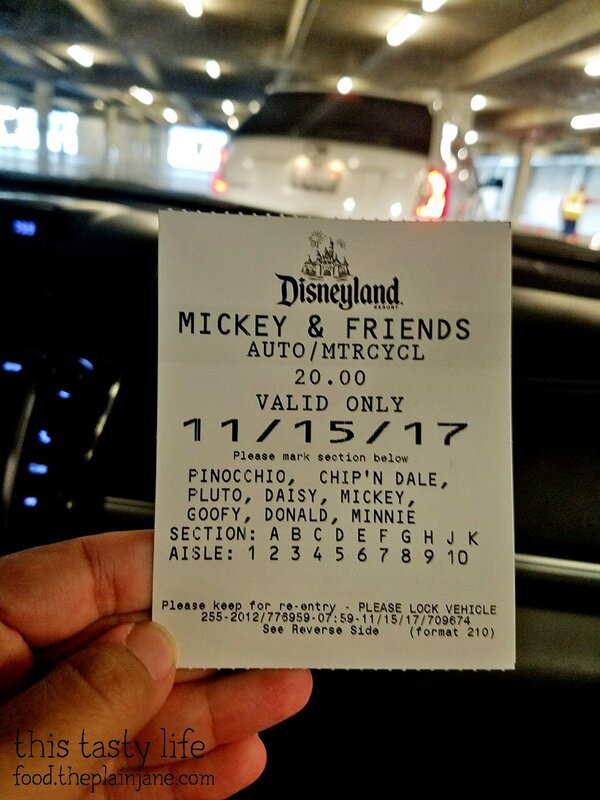 Thanks for the link, too, but it looks like the free parking is only for certain passholder for Disney World, not Disneyland. I wish parking was free!! For Disneyland free parking is only available to the Signature and Signature Plus passholders. Maybe in the future! Hope you get a trip to Disney soon! That’s cool you have an annual pass. Now you can try all the food stands! Hi Soo – Yes, we’re looking forward to it! We’re going again tomorrow! 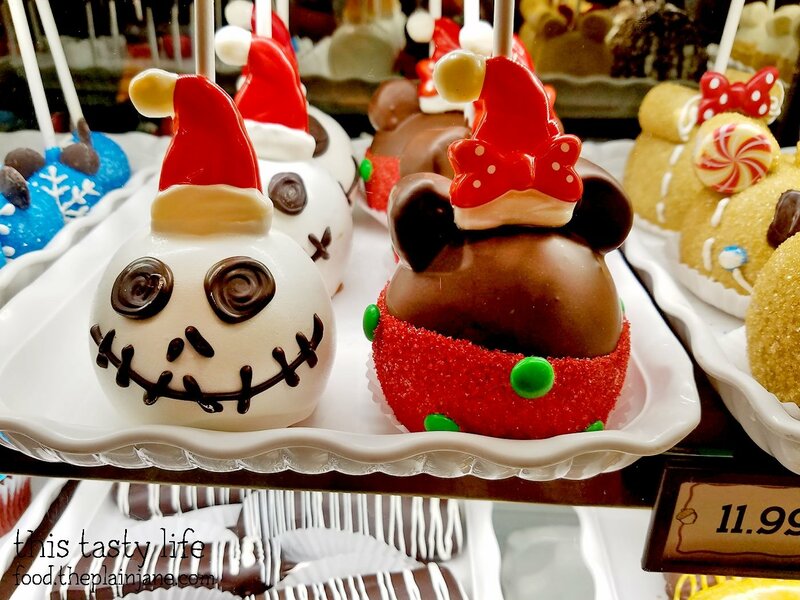 Omg I miss disneyland and disneyland food! Haven’t been there since the last time I was an annual pass-holder way back when. I so wanna go. I used to go there for free all the time when I knew someone that used to work there, back when younger. So many memories. My mom said I got lost there when I was one because I wandered off to go chase Mickey or something. 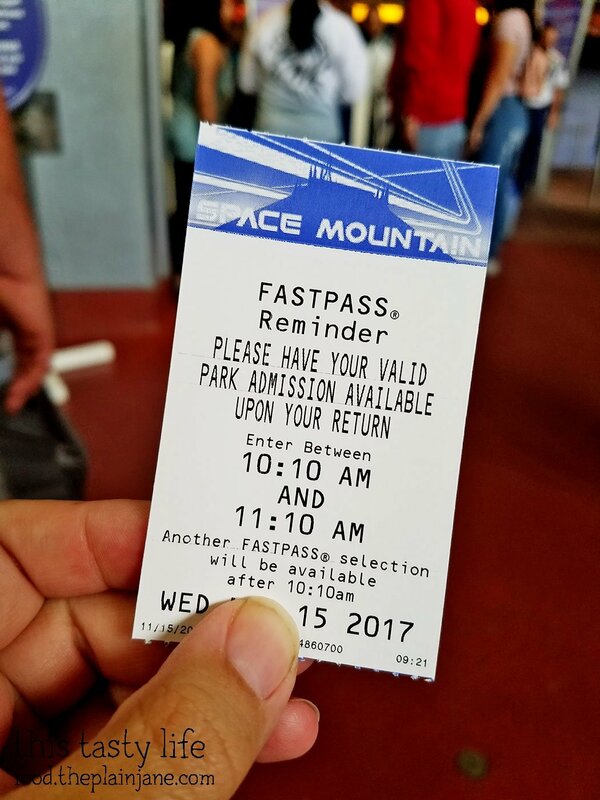 Hi Miss Kim – This is our first time being passholders! We’re excited to be able to check out more foods, plus it makes for a good walking day, haha. Also it doesn’t sound like you were lost, sounds like you were just enjoying yourself!